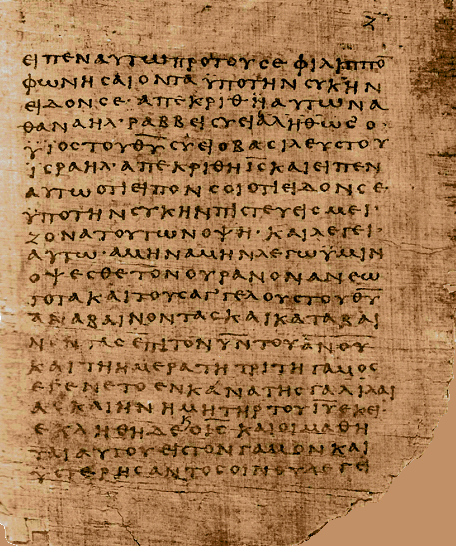 Papyrus 66 (text shown: John 1:48-2:3). This seems so old-fashioned now. 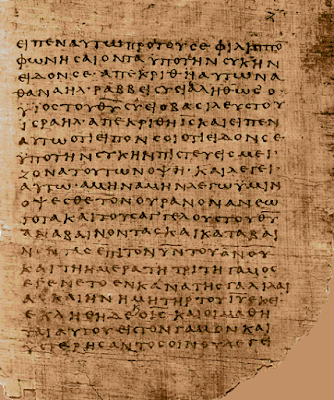 I hope to soon present a post about Papyrus 64 and Papyrus 67, but in the course of looking into those fragments, I found an outstanding resource on a much more substantial manuscript: Papyrus 66, an early an important manuscript of the Gospel of John. Papyrus 66 is generally assigned to the early 200’s, although some researchers have thought that it was even earlier. There is plenty of information about the text of Papyrus 66 online, so here I will just provide a link to the new resource which has been produced by ARTMYN. This format is the Rolls Royce of digitalized manuscript-views. Not only are the images zoomable, but they can be tilted and rotated, and even the light-angle can be adjusted. There is even a guided tour. The site includes a tutorial on how to view the manuscript. A brief video-guide to the use of ARTMYN on tablets is also available at the Sotheby’s website. The Chrome browser is recommended when using this resource, and so is the strongest internet signal you can get. Other manuscripts and antiquities that have been prepared for the ARTMYN viewing-tool can be accessed at https://www.artmyn.com/partners/fondation-bodmer/ . Mark 1:2 - In Isaiah, or In the Prophets?